Her daughter, Manjinder received a call from her father and brother to say her mother had fallen and was on the way to the hospital. On arrival doctors told the family that due to the type of haemorrhage she had, she was likely to have another. 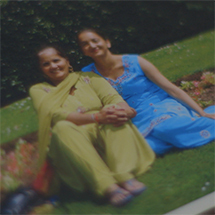 The next day Surinder had a second haemorrhage and the family were told that nothing more could be done. Surinder was a devout Sikh lady and the family felt that because she was such a giving person in life, in death she would have wanted to be also. The family decided to donate 5 organs as 5 is a significant number in the Sikh faith. Surinder's family also donated her corneas as they felt that she would have liked the idea of giving someone the gift of sight.